Which is worse—moving in the wrong direction or not moving at all? It’s a question that I recently heard on an episode of Scriptnotes, an amazing podcast about screenwriting (and just writing in general) and I’ve been mulling it over in my head ever since. The reason why the question struck such a chord in me is because I feel like I just spent the past year not moving at all, in lieu of accidentally moving in the wrong direction and now that I’m on the other side of it I have to wonder if it did me any good. Probably not. But at the same time, it wasn’t completely worthless. It’s not like I went into 2015 thinking “yeah, I deserve a break.” In fact, it was quite the opposite. I remember clearly what my emotional state was last New Year’s Eve. I had big things brewing, big opportunities on the horizon and a lot of lofty ideas about how I wasn’t even going to be the same person in a year’s time. Only one of those things ended up being true and not in the way I was imagining. So why did I fall off the face of the comic world for a year? The answer is something that I think all comic book creators go through at some point in their careers. As a comic book writer, I often liken myself to the story of The Little Red Hen. If you’ve never read the story as a kid, the Cliff Notes version is that this little red hen wants to make some bread, so she goes around the farm asking the other animals to help her out. She’s all up in their face like “Who will help me make this bread?” And nobody wants to help her. Tags: Blog, cardboard kingdom, Comic Book Writing, comic conventions, comics, MSU comics forum, Saturday Morning Snack Attack! Categories Blog, Comic Book Writing, Comics, Saturday Morning Snack Attack! Comic book artists deserve to be paid. But here’s the hard truth nobody wants to ever deal with—so do comic book writers. Lately I’ve watched as the conversation about paying comics book artists has shifted into a dangerous direction, with artists essentially declaring that they’re most important member of the team while simultaneously dismissing the contributions that writers bring to the table. And as much as it bothers me, I understand why it’s gotten to this point, because I think artists get the wrong impression about what comic book writers actually do and what we have to go through to work in this industry. This is in no way my counterattack against artists (though ya’ll have done plenty of attacking on writers lately) instead it’s me doing my thing—writing about the world the way I see it. And I hope that by sharing my perspective with my fellow comic book creators, we can all get back to making comics together like the badass super teams we are, instead of the divided front we’ve created recently. Mystery Club (and their talking dog) are all about solving mysteries and meddling with folk they ought not meddle with. 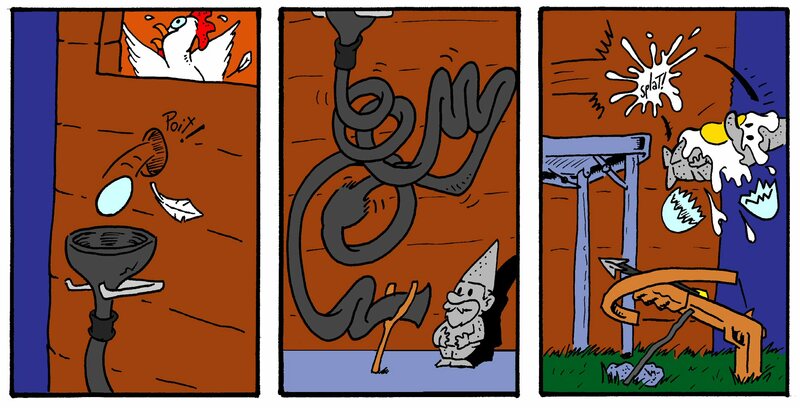 Today let’s take a closer look at the second story in Snack Attack vol. 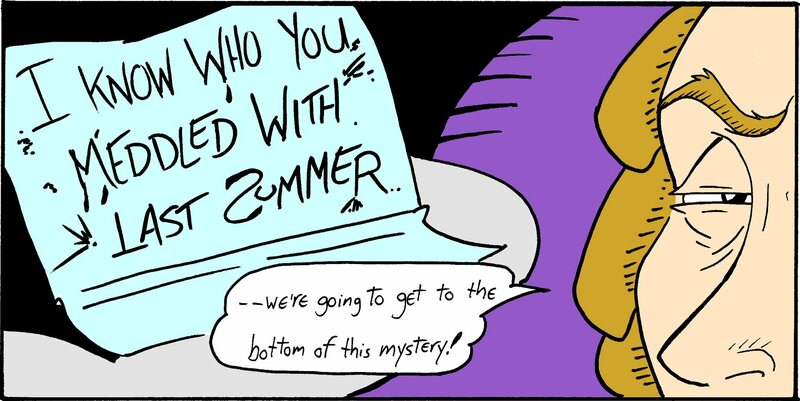 2, a story of betrayal, sabotage and good ol’ fashioned mystery solving- I Know Who You Meddled With Last Summer. This collaboration came together in a different way in that I picked the idea to match the artist and vice versa. Me and Jesse Hughes of Plummy Press go way back together, we’ve been making Science Girl together for a few years now, but we’ve never had a chance to collaborate on something different. We try to fill Science Girl with as much of the kind of fun cartoony stuff that we grew up with, but it was nice to branch out even further and try something new together. Meddled is based off our shared love of Scooby-Doo and while most of the Snack Attack! stories are influenced by cartoons or kids shows that I grew up with, this is the first story where I just decided to do a straight up parody instead of an homage. But as mystery-loving teens tend to do. Mystery Club has pissed off a lot of shady business people in the past and there’s a long list of potential suspects. Mystery Club employs complex Rube Goldberg traps to get things DONE. When I set out to write the script for Meddled I really wanted to play to Jesse’s cartoonist style, which is something I don’t always get to do when writing Science Girl. So I knew right off the bat that there were two different things I wanted to include in the script. For one, I wanted to include a scene where we see all of the suspects– just so I could have fun coming up with different monster/ghost ideas and that Jesse could have fun coming up with different designs for them. The other idea I wanted was a Rube Goldberg-esque trap sequence. I always loved those as a kid (with Pee Wee’s breakfast machine being my all-time favorite. ) You might as well call Jesse by the name Kevin McAllistar from now on, cause this dude is a master at setting up traps. He nailed that trap scene– and the rest of the story too. He really brought his cartoonist pencil with him and I’ve always felt Jesse’s a little more of a Disney and Warner Bros. style than a Hanna-Barbara style, so it was cool to see his unique take on a Hanna-Barbara inspired story. The character of Casey was based off of Shaggy from Scooby Doo and was named after the late Casey Kasem, who voiced Shaggy for many years. It’s a little strange to be promoting this story now, right after the passing of Casey Kasem, who was the original voice actor for Shaggy, a role he played all the way until 2009. There is a character in Meddled named Casey, who I named as an homage to Casey Kasem. At the time when I wrote the script, I was just doing it to honor a great voice actor that I grew up enjoying (and I always loved it when he showed up on Saved by the Bell, too!) But now it serves a sort of memorium to the actor. Will we ever see the likes of Mystery Club again? Categories Blog, comics, Comics, Saturday Morning Snack Attack! When there’s an evil beastie messing up your house, who you gonna call? Nope, not the Ghostbusters. They couldn’t handle this business. Only Abigail Astoundo, 11-year-old Beastie Buster has what it takes to save the day. Today we’re taking a look at the first story in Saturday Morning Snack Attack! vol. 2, a tale of action, adventure and flying llama creatures– Abigail Astoundo: Beastie Buster. 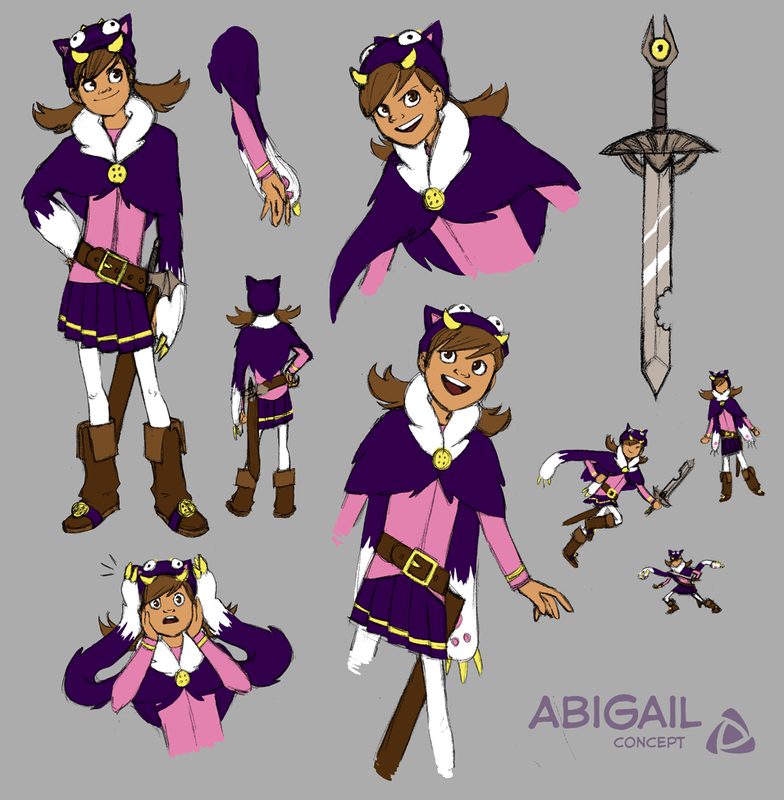 Despite her young age, Abigail is ready to take on the Astoundo family business of busting evil beasties using her family’s legendary sword, the Beastbane– a mystical blade that has the ability to turn into whatever a monster is weak against. Abigail might be strong, brave and confident when it comes to fighting beasties, but she’s about to find out there are worst things than monsters lurking in the woods– like teenage boys. Abigail Astoundo just might be the world’s last beastie buster, but it seems her kind is about to be replaced by beastie trainers– people capable of capturing and controlling monsters using magic gauntlets. Only 11-years-old and Abigail’s already finding out that her job skill is becoming obsolete and that the world is moving on without her. But there’s still plenty of work for a beastie buster to do–because sometimes, an evil beastie is really just an innocent creature being manipulated and controlled by a beastie trainer. Rose McClain, the artist for Abigail Astoundo: Beastie Buster is an up-and-coming superstar who also works on the educational comic Solution Squad and the webcomic Scoundrels. I met her at Detroit Fanfare when I was premiering Snack Attack! vol. 1 and she was there to promote Solution Squad. She picked up a copy of the book and we got to talking and she said she was an artist who’s always looking for new work. When you’re a writer and you hear those words, you don’t hesitate. I immediately got in touch with Rose for the next volume of Snack Attack! and I knew she’d be the perfect artist for Abigail Astoundo. Rose fell in love with Abigail immediately and I knew it was a match made in heaven. We started to collaborate together on how to bring the story together and we decided to do something new, something I hadn’t yet done as a comic book writer. The designs for the characters were all created by me and then tweaked by Rose to look more appealing. It took me a long time to get Abigail’s look down right. I knew I wanted her to have some sort of monster skin cape/scarf with a hat to match, but it took me forever to get it right. Eventually I came up with the giant monster paws, which Rose took even further by giving the paws a kind of life of their own. They can hang behind Abigail like a cape, cover her own arms like sleeves or move on their own to express emotion. I’m not going to lie– I wish I had a cape like this in real life. I would wear it all the time and embarrass my family and friends. You may have noticed that Abigail’s sword, the Beastbane, has a giant bite mark taken out of it. The bite was my idea– I wanted the sword to look old and beat up, since it was passed down in the Astoundo family for generations. I figured at some point, some monster had taken a chomp out of it. Rose picked up on the idea and took it even further by adding a little bite mark or missing section whenever the Beastbane transforms into another object. When you’re reading the story, try to find all the little hidden bite marks. Here’s hoping that you’ll see more Abigail Astoundo in the future. Rose and I have already talked about continuing with Abigail’s story. Where does she go from here now that she knows beastie trainers are out there, taking control of monsters and making them do bad things? How do you survive in the world when your profession of choice is dying out? These are the questions we look forward to answering. But for now, you can find Abigail Astoundo in Saturday Morning Snack Attack! vol. 2 now available for purchase in the K is for Komics store. 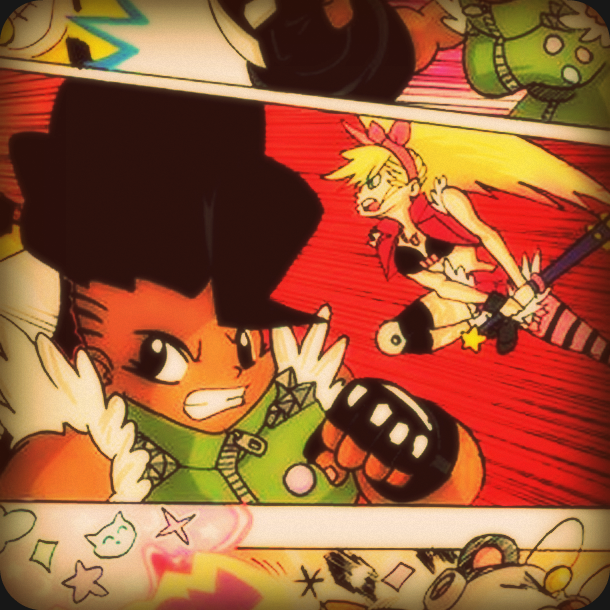 Tags: Abigail Astoundo: Beastie Buster, comics, Rose McClain, Saturday Morning Snack Attack! 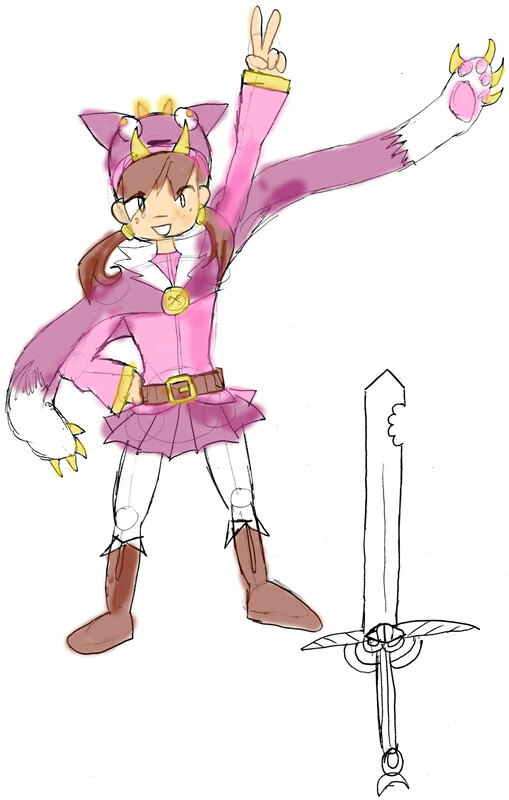 Lucy the Pink Falcon Sentinel from FLYING SOLO. Today I’m proud to introduce the final story in the SATURDAY MORNING SNACK ATTACK! anthology– FLYING SOLO with art by Edwin Domingo and story by K-Mo! FLYING SOLO features a team of multi-colored costumed heroes called Super Sentinel Taskforce, who are an homage to Power Rangers, Super Sentai and Gatchaman. 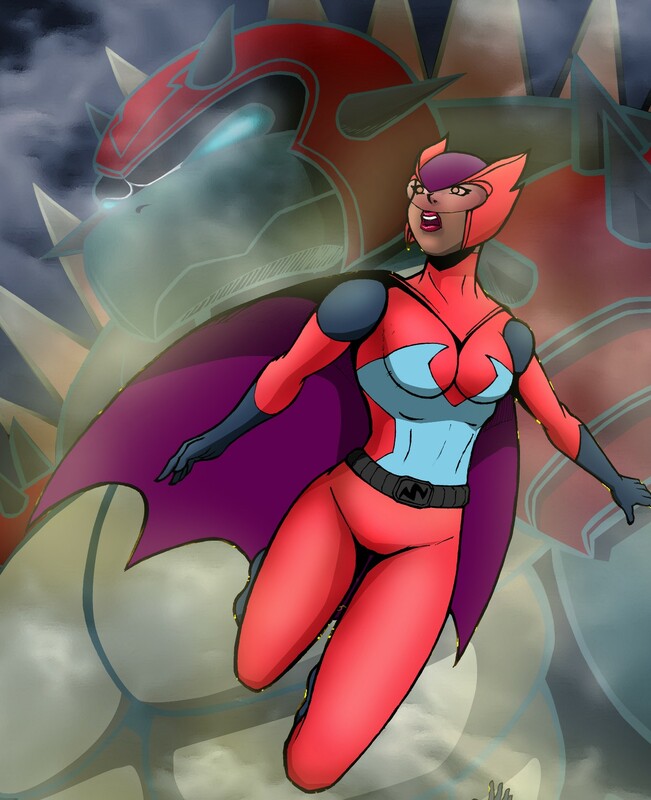 When the Pink Falcon Sentinel starts to feel like she’s not being used to the best of her abilities, she quits the team to forge her own path– right before a devastating monster attack. Categories comics, Saturday Morning Snack Attack! Bea from MY DEMONIC SWEET 16 uses her powers for the first time. If you loved “Sabrina the Teenage Witch” as a kid, but hated that the show never featured any Lovecraftian monsters, then you’re going to be excited to read the third story in the SATURDAY MORNING SNACK ATTACK! anthology– MY DEMONIC SWEET 16 with art by Johnny Whaam and story by yours truly. Tags: Comic Book Wednesday, comics, Cthulu, K-Mo, My Demonic Sweet 16, Sabrina the Teenage Witch, Saturday Morning Snack Attack! Two of the stars of STAKE AND SCEPTER — Ellie Nightshade and Judy Daywalker– as they run into the fray. Have you ever wondered what it would be like if Buffy the Vampire Slayer had Sailor Moon as one of the Scooby Gang? If so, you’re probably a lot like me and you would probably enjoy the second story in the SATURDAY MORNING SNACK ATTACK! anthology titled STAKE AND SCEPTER featuring art by John Sowder of Divine Authority Comics! Ever since The Avengers made movie history (and a kajillion dollars in revenue) it seems like every comic fan with a keyboard has put in his or her two cents about which characters we can expect to see for the sequel. These lists are filled with the usual suspects—the most popular and longest-lasting characters to grace the pages of any Avengers comics. The problem is—from a logistical standpoint, a lot of these characters just aren’t probable for new recruits the next time around. As much as fans might be clamoring to see these characters join the ranks, don’t expect these ten Avengers to show up on the big screen any time soon. Team Science at Kids Read Comics! Do you have kids? Do you know some kids? Are you a kid, either real or just at heart? Then you’re not going to want to miss this weekend’s FREE comic convention Kids Read Comics, Saturday July 7th and Sunday July 8th at the Ann Arbor District Library. I’ll have a table there along with SCIENCE GIRL artist Jesse Hughes, so stop by, say hello! We’ll be selling issues of our comics SCIENCE GIRL as well as handing out free mini-comics for the kids. We’ll also be debuting our snazzy new SCIENCE GIRL buttons, so stop by and show off your science love in style!